Singapore company deploys Irys RFID jewelry management system to boost productivity - Irys Pte. Ltd.
“Old is Gold” and this applies quite literally to On Cheong, one of oldest and most trusted heritage jewellery brands in Singapore. Though at On Cheong, Old certainly does not mean outdated. In keeping with the times, On Cheong has implemented RFID at their stores for inventory tracking. This technological upgrade comes at a time when the market demands newer approaches to boost productivity and increase sales. A two-year in-depth study on the technology led to various solutions, both local as well as from overseas vendors, being considered and tested for their reliability and accuracy. Irys, a company specialized in RFID implementation exclusively for the Gems and Jewellery Industry, was ultimately selected to be the partner for the project. “The degree of accuracy which Irys was able to demonstrate in our retail set up, surpassed other RFID jewelry management system we came across. 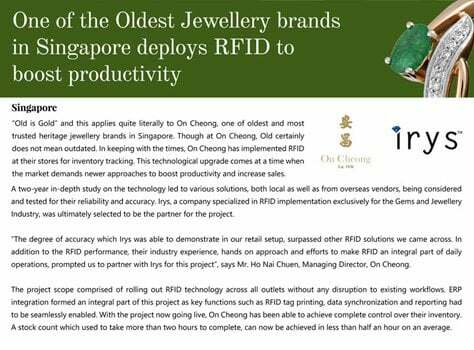 In addition to the RFID performance, their industry experience, hands-on approach and efforts to make RFID an integral part of daily operations, prompted us to partner with Irys for this project”, says Mr. Ho Nai Chuen, Managing Director, On Cheong. The project scope comprised of rolling out RFID technology across all outlets without any disruption to existing workflows. ERP integration formed an integral part of this project as key functions such as RFID tag printing, data synchronization and reporting had to be seamlessly enabled. With the project now going live, On Cheong has been able to achieve complete control over their inventory. A stock count which used to take more than two hours to complete, can now be achieved in less than half an hour on an average.